Different Article Types: The content of a journal should reflect the Editor's aims in publishing the journal and include a range of high-quality articles to encourage authors to submit. When looking to develop the journal's profile and make impact in the field, different article types are used to build up the journal's reputation. The different types of article used are outlined below. The essence of this imformation is to educate prospective authors on how to develope their manuscripts. Editorials: Short articles written by members of the Editorial Board describing policy issues relevant to the journal. We require Editors to write an editorial for the launch of the journal explaining why it was started. Once launched, editorials should be used to keep readers up to date with important developments, for example highlighting new article types launched in the journal and any policy changes. Research: A comprehensive report of a systematic investigation into and study of materials and sources in order to establish facts and reach new conclusions. Reviews: Comprehensive, authoritative, descriptions of any subject within the journal's scope. Reviews are often commissioned from experts in the field, and should have an educational aim. Long reviews and short reviews have different readerships and characteristics - a mixture of both is ideal. Corrections: Correction articles are published when an author identifies factual errors or omissions in a manuscript. Please contact your Journal Development Editor for guidelines on publishing correction articles. Book reviews: Short summaries of the strengths and weaknesses of a book, evaluating its overall usefulness to the intended audience. Case reports: Reports of clinical cases that can be educational, describe a diagnostic or therapeutic dilemma, suggest an association, or present an important adverse reaction. All case report articles should indicate that informed consent to publish the information was granted from the patients or their guardians. Case studies: Descriptions of a major programme intervention or policy option relevant to the journal field. Case study articles should include a rigorous assessment of the processes and the impact of the study, as well as recommendations for the future. Commentaries: Short, focused and opinionated articles on any subject within the journal's scope. These articles are usually related to a contemporary issue, such as recent research findings, and may be commissioned from opinion leaders in the field. Database articles: Descriptions of a new database or a substantial improvement of an existing database. Debate articles: Presentations of an argument that is not essentially based on practical research. Debate articles can report on all aspects of the subject including sociological and ethical aspects. Letters to the Editor: These can take three forms: a substantial re-analysis of a previously published article or a substantial response to such a re-analysis from the authors of the original publication, or an article that may not cover 'standard research' but that may be relevant to readers. Hypotheses: Short articles presenting an untested original hypothesis backed solely by previously published results rather than any new evidence. They should outline significant progress in thinking that would also be testable. Meeting report: A short description of a conference that the author has attended, which focuses on the key developments presented and discussed at the meeting. Methodology articles: Presentations of a new experimental method, test or procedure. The method described may either be completely new, or may offer a better version of an existing method. The article should describe a demonstrable advance on what is currently available. Short reports: brief reports of data from original research. Software articles: describe the source code for software applications, tools or algorithm implementations. Typically, an archive of the source code of the current version of the software should be included with the submitted manuscript as a supplementary file. Study protocol: Describes proposed or ongoing research, providing a detailed account of the hypothesis, rationale, and methodology of the study. 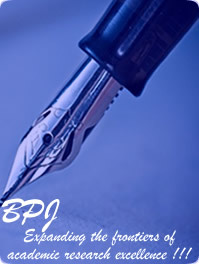 Should you have any questions about developing your manuscript, please contact us at: service@bluepenjournals.org.